The Chicago District Golf Association is the governing body for amateur golf in the region, serving 80,000 golfers in a four-state area. 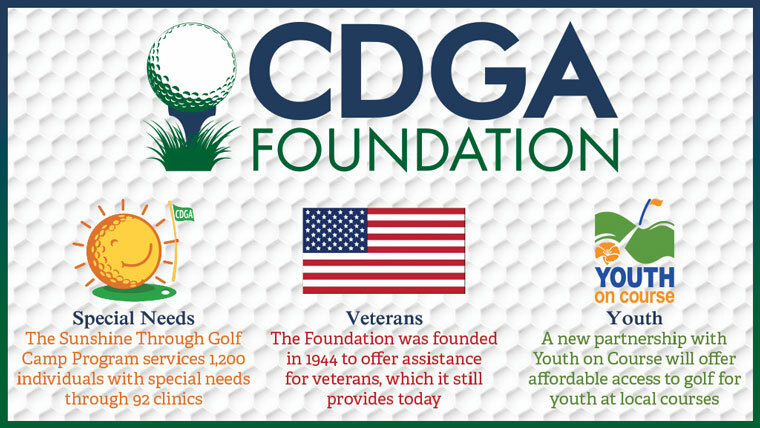 Their foundation, the CDGA Foundation, was originally founded in 1944 to service returning World War II veterans. Today, the CDGA Foundation continues to aid wounded veterans with its veterans program, which utilizes the game of golf in a therapeutic way as part of a managed rehabilitation program. The Foundation also works to bring joy to people with special needs through golf by bringing the game directly to those individuals. This year, the CDGA Foundation introduces a new program, Youth on Course, which focuses on bringing affordable access to the game for youth. Works with disabled veterans, active duty service members and their families at Chicagoland VA hospitals and the Great Lakes Naval Base. Clinics are held at the Three-Hole Sunshine Course and on the naval base. New program in 2016, giving youth golfers access to the game at select courses for $5 per round. While new to Chicago, the program has been a success in other regions of the country at growing the game.